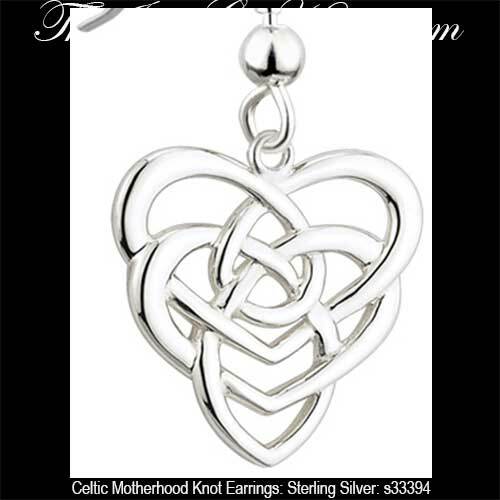 The Celtic motherhood knot is a stylized Trinity knot depicting a parent and child embrace. Combined with the Trinity knot, it is a true testament to the enduring bond between a mother, her child, faith and their heritage. 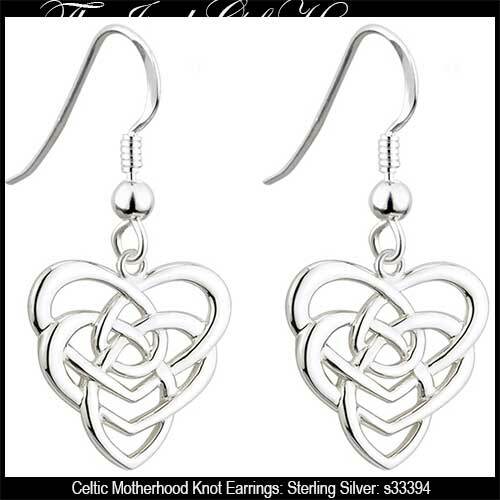 The Celtic mother knot earrings have the appearance of 2 hearts made of open knot-work. One heart is lower than the other and both hearts are intertwined in a continuous Celtic knot motif. The sterling silver Celtic motherhood knot earrings feature an intertwined filigree design of the Trinity knot and two hearts. The Celtic mother's knot drop earrings are on fishhook wires and measure 5/8” wide x 1 1/4” tall, to the top of the wire. These Irish earrings are made in Ireland by Solvar Jewelry and are gift boxed with Celtic knot and Celtic motherhood knot history cards, compliments of The Irish Gift House. Read more about the Celtic Motherhood Knot on our BlogSpot.